Smart home technology is great. The Nest Learning Thermostat, Phillips Hue, and Sonos sound systems are wonderful products that make life more convenient, automated, and beautiful. These technologies are great, but many components in a smart home are controlled by applications from a smart phone or tablet. Having to pull your phone out of your pocket and unlock it every time you want to turn off the lights while watching a movie can be a little annoying. Fortunately, the Logitech Harmony Home Control makes running a smart home a little easier. The remote works great for controlling your media center, but it also can be programmed to control many different home automation devices. 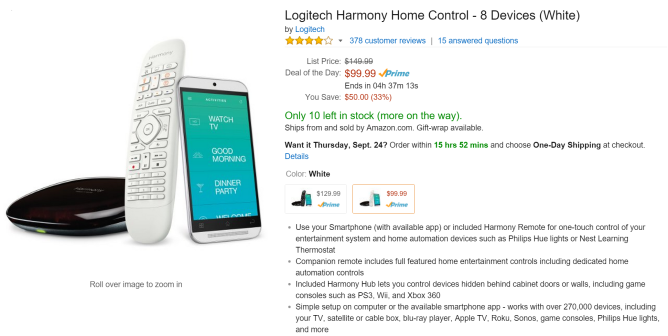 It's normally a bit on the pricey side at $150, but today you can pick one up for just $99, the same price as the less feature filled Logitech Harmony Smart Control. The biggest differentiating feature between the two devices is that the Home Control has dedicated buttons to control smart outlets and WiFi connected lights while the Smart Control does not. Included with the remote is the handy Harmony Hub (say that ten times fast) which lets you control IR sensing devices, like your blu-ray player or game console, behind closed cabinet doors. The reviews on the device are fairly polarized. Overall, it scores a 3.8 on Amazon, but there are a fair amount (14 percent) of one star reviews mostly from people complaining about the remote not supporting certain devices. So, make sure to read the reviews and customers question and answers section before you make your purchase to verify your gadgets are supported. If you are interested, act fast. The deal expires at 12 AM PST. Also, note that the deal only applies to the white model, the black one is $30 more. If you already own one of these systems, let us know how you like it in the comments below.